One thing I am so happy about with regards to the “big W” next year is that my big brother has agreed to officiate the wedding for us and my sister will be standing up with me as my most awesome Best Lady. Now, neither Damir or I have any idea yet what the actual ceremony might entail, but its already comforting to know that up there at the front with me will be the love of my life, and my brother and sister. 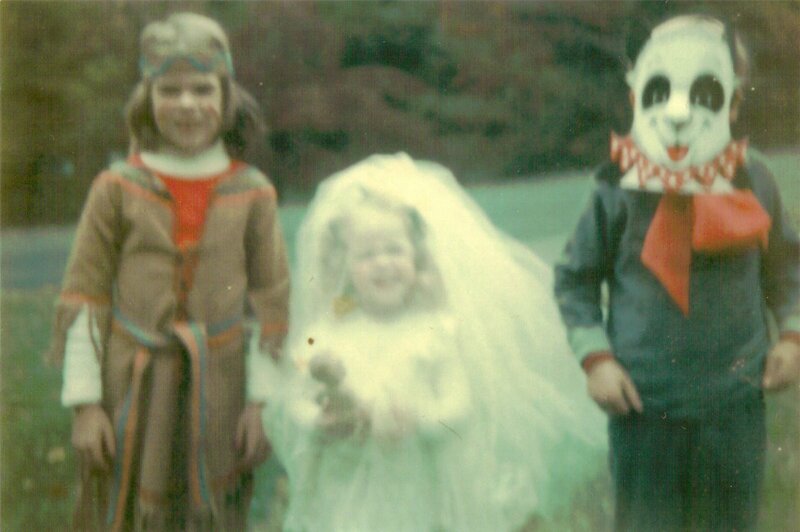 Hopefully the ceremony will be just like the picture above from circa 1978– my sister on one side, my brother on the other and me in a wedding dress. Though I don’t imagine they’ll be wearing costumes, but I’d certainly be open to it if they really wanted. I always wanted to say that my brother married me. Ha! Get it? Try the veal, and don’t forget to tip your waitress. 741.07 Persons authorized to solemnize matrimony. (1) All regularly ordained ministers of the gospel or elders in communion with some church, or other ordained clergy, and all judicial officers, including retired judicial officers, clerks of the circuit courts, and notaries public of this state may solemnize the rights of matrimonial contract, under the regulations prescribed by law. So the question is: what is a “regularly ordained minister”? Of course we can go to City Hall and have it done “for real” but it would just be nice to have some clarity on this issue: yea or nay? On a related note: one more decision is in the books, we picked our photographer. Super exciting!